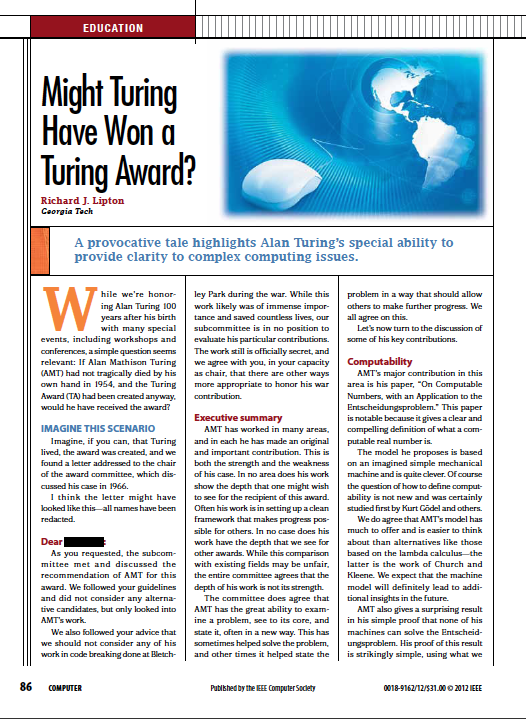 Might Turing Have Won A Turing Award? Ann Sobel is a software engineer who is active, besides her research and teaching, in the IEEE Society. She regularly runs a column in their Computer magazine on education. Today with her and IEEE’s kind permission I would like to put out an article that I wrote as a guest for her column. Would Turing have actually won a Turing Award? Sure, he would have won an early Turing Award. The selection process in the early days was very much cognizant of both technical contributions as well as being a huge positive influence to the field. Alan Turing did more than enough on both counts to ensure election. Having recently served on the ACM Turing Award Committee for the 5 year term, I’m quite sure that he would also have easily been given the award today. Negative. 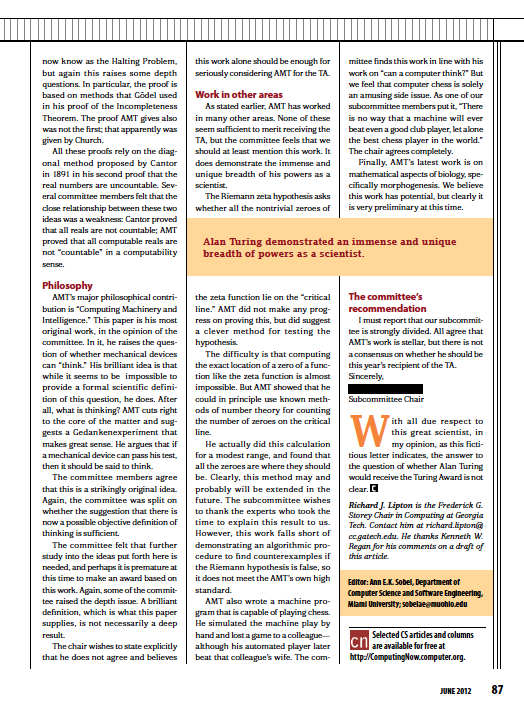 Turing’s work would be deemed way too simple to even warrant publication in a decent journal. No five-letter taxonomic acronyms. No constants approximated one decimal digit further thanks to dozens of pages of tedious computations. Worst of all, all the proofs are so trivial that even advanced undergrads can comprehend them– in short, absolute junk not worth a modern computer scientist’s time. I agree. Turing would have invented ArXiv in order to be able to publish somewhere. While it may be easy for an Advanced Undergrad to comprehend AMT’s papers today, I don’t think they would have in his time. The body of knowledge we have these days is far greater than what was available in the 40s/50s. For instance, Newton’s works is not considered “Higher Physics” anymore. High school kids know that stuff! But if you put it in perspective with what his contemporaries knew, it was pretty advanced. |Same with AMT. This is fair commentary, Turing was a genius in his own era, and was a pioneer. The depth of specialization today is somewhat mindnumbing to say the least. So its a good point that there is tremendous value of being one of the first people in a new area of research. The sociological importance of computers in the present era certainly has a lot to do with the way we regard him now. Things were different when there were hardly any of them and Turing’s role in the outcome of WWII hadn’t been made public. Hard to compare, but Turing was certainly a founding father and a pioneer within his field. He is revered in Manchester, where he worked for the University of Manchester. However, the real tragedy is that his life was cut short and we can only speculate on what he may have achieved. Very interesting post. I think Aaron Swartz too, just like Alan Turing, would deserve to have a prize created in his honor. These two geniuses have chosen to take their own lives rather than facing unfair jail sentences.